Preheat oven to 180°C/ 160°C fan-forced and lightly oil a large oven-proof dish. Bring a large pot of salted water to the boil and cook potatoes for 10 minutes or until tender. Drain and mash with ricotta cheese. Stir in tomatoes, tomato paste and carrot. Cover and cook on medium heat for 15 minutes until carrot softens. Now stir through frozen peas and mint. Season to taste. Pour mixture into oven-proof dish and evenly spoon mashed potato on top. Sprinkle with parmesan cheese and bake for 35 minutes or until cheese is golden and the filling is heated through. Serving suggestion: Serve with a green salad or some steamed/ blanched green beans, zucchini or squash. You could also bake this in 6 individual ramekins (small ovenproof dishes). Post GDM suggestion: Add 100g toasted pine nuts and 100g sultanas to lamb mixture along with mint. ‘Until fragrant’ really just means until you start to smell the perfume of the spices coming out of the pan. Loved loved loved this ! cooked it last week… was such a yummy winter meal with a hint of spice… very DELISH! Thanks Sophie. Not sure if you guys got through the whole dish, but it’s great the next day & also freezes really well. 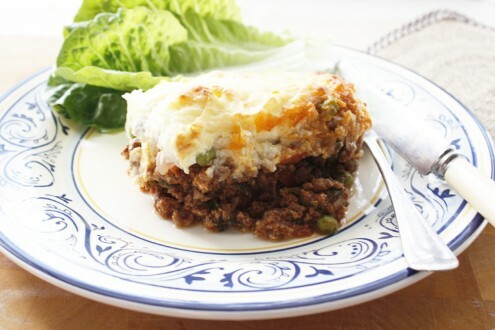 I am a total moussaka fiend….how tasty will this be on a cold, winter’s eve! Just finished eating our first GDM friendly minted lamb moussaka. My husband and I could not even talk while consuming it because we were so absorbed by our meal. Thank you! Our whole week of food is planned out using your recipes, what a treat to have this site and know you can cook such delicious things that are healthy too. Thanks! I’m so glad you guys are enjoying the recipes. I like how you planned your weekly meals. Very organised. I do the same thing & it not only helps me save time but I find we have less wastage than when I randomly shop for ingredients. This recepie looks amazing but is it safe to eat ricotta cheese during pregnancy?